"Technology is the future," he says, "and my love for it meant that I have only ever wanted to work in computer networking. When it came to choosing the right university, LSBU was the right choice for me because in my view, it is the best place to study Computer Systems and Networks. As soon as I found out about the course, I wanted to secure my place!" Once he started at LSBU, Marciano quickly realised just how important a global perspective was in order to succeed. "The lecturers are all very well connected and the major players in my industry work all over the world," he explains. "As a result, I was keen to do whatever I could to secure a truly international education, so the chance to take part in the Erasmus programme was a welcome addition to my course." Marciano describes his decision to apply to Erasmus as being based on "looking for new experiences and new horizons." 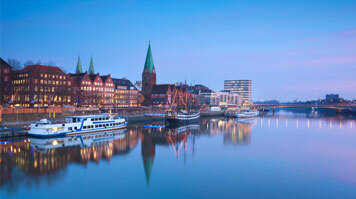 He didn't hesitate at all when he realized he had the opportunity to spend time studying in Bremen, Germany. "I knew what I wanted to do from the very beginning, so there were no second thoughts or concerns – I couldn't wait to get started," he says. While he was in Bremen, Marciano took a German course to help him communicate with his classmates more easily. "It is another valuable skill I have acquired," he says. "Being able to speak a number of languages can open new career paths up to you, and give you more opportunities. I was pleased to pass my German exam, and who knows when an understanding of the language might come in useful?" Marciano is certain that the experience of studying in Germany will help his career. "It was a golden opportunity to study abroad, and I really believe that it will help my CV to stand out from the crowd," he says. "It was fun from a cultural perspective too, as well as the chance to see my industry in a different light. I visited Hamburg and Hannover amongst others, and it was wonderful to see places that I would not otherwise have been able to." After such a positive experience, Marciano has no reservations about recommending Erasmus to others. "It will help you to expand your knowledge," he says. "It isn't just about having something to put on your CV in the short term, but about developing skills and a mindset that you will be able to build on in the future."